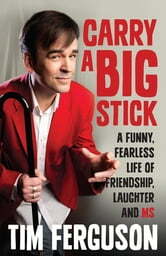 A funny, poignant and inspirational story of widely acclaimed comedian, writer and producer, Tim Ferguson. Tim Ferguson was a star of the international comedy circuit. Along with Paul McDermott and Richard Fidler he was part of the edgy, provocative and very funny Doug Anthony Allstars (DAAS). In 1994 they were at the height of their powers, performing in a season at the Criterion Theatre on Piccadilly Circus. The three mates, who began busking on the streets of Canberra a decade earlier, had achieved their ambition to become the self-styled rock stars of comedy. Then, all of a sudden, Tim woke up one morning and his whole left side wouldn't work. He'd had a lurking suspicion that something was wrong and after more episodes he went to a doctor thinking he'd be told to change his diet and get more sleep. It wasn't so simple. An eventual diagnosis of multiple sclerosis (MS) meant an end to the frenetic, high-energy life he was living. Carry a Big Stick meanders through Tim's life, and explains how the boy who went to nine schools in 13 years got used to saying, 'Hi, I'm the new kid'. It will detail his ambitions to become an actor and how the Doug Anthony Allstars were born and went on to become what Rolling Stone called 'The 3 amigos from hell'. Diagnosis changed a lot of things but Tim's quick wit and sense of humour weren't affected. This inspiring memoir shows us that you can laugh in the face of adversity. Tim Ferguson, shows that he was more than the good looking iconaclast and subversive of D.A.A.S. fame. Easy to read and a must if you are fondly rember D.A.A.S at thier peak. I thoroughly enjoyed reading this autobiography of Tim Ferguson's very interesting life so far. Poignant at times with plenty of comic relief.